Istituto Italiano di Preistoria e Protostoria. Scientists discovered stones for grounding flour in Italy used 30,000 years ago by hunter gatherers. Dig up cattails. Remove starchy roots and rhizomes. Peel outer layer, dry, and grind into flour with two rocks. Mix with water and cook. Bon appetit! The Paleolithic diet, it turns out, may have consisted of more than just meat and berries. 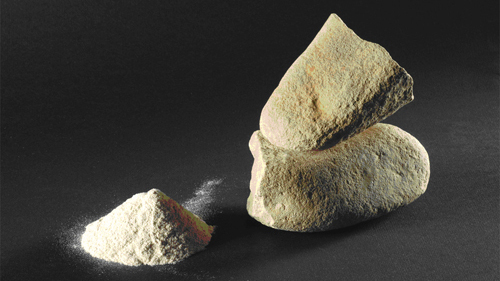 At three sites in Italy, Russia and the Czech Republic, scientists have discovered tools that would make a Stone Age Crate and Barrel manager burst with pride:Mortars and pestles for grinding grains. The mortars are flat stones, while the pestles are pointed andshaped to fit the hand. They all show wear from grinding, as well as microscopic bits of “flour” embedded in them. The flour appears to have been ground from the starchiest, underground parts of cattails, ferns and other plants. Anthropologists have assumed that early humans supplemented their meaty, protein-heavy diet with nutrients from plants. Plant starches are energy-rich carbohydrates, but aren’t exactly “ready-to-eat.” The latest discovery confirms that humans as far back as 30,000 years had figured out how to “process” some of those starches before consuming them. In terms of the energy it provided, the cattail flour is pretty similar to Emmer wheat (known as farro in Italy). It’s been a staple of European cooking for millennia that’s believed to have fed the marching Roman legions. As for taste, the researchers didn’t report results. But without yeast or sugar or even salt, chances are cattail bread wasn’t terribly tasty. But memorable? Well, we’re still writing about it.